Lean beef sirloin is the lean portion of beef sirloin that contains less fat than portions of beef sirloin not as lean. It too is mainly used in steak. 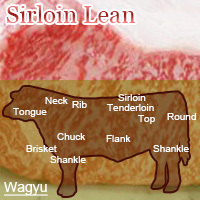 Wagyu sirloin steak is well known for its marbling. It is high in unsaturated fats giving it less calories than other types of beef. The calories in Japanese Beef Sirloin Lean per 50g(1slice) is 159 calories. Japanese Beef Sirloin Lean is calculated to be 317Cal per 100 grams making 80Cal equivalent to 25.24g with 12.9g of mostly fat、8.55g of protein、0.2g of carbohydrates in 50g while being rich in vitamins and minerals such as Vitamin B12 and Niacin.